To mark the 50th anniversary of the Giulietta Sprint, Alfa Romeo has organised a long series of events and exhibitions in conjunction with the Alfa Romeo Italian Registry and the Portello Stable. The aim: to revive the history of an extraordinary legend. This was the brief for the numerous events planned in Milan from 15 May to 20 June 2004 that will naturally be starring the Giulietta. These include: two major international gatherings planned for the Lombard capital; race days at the Monza race track; an exhibition entitled 'Giulietta e il suo tempo' at the Palazzo della Ragione in Milan; visits to the Museo Storico in Arese and the Alfa Style Centre; test drives on the Balocco track - and lastly a concert in Piazza Duomo performed by the Teatro alla Scala Chamber Orchestra. This event-filled calendar is the least we could do to provide a proper celebration for the forerunner of an entire class of cars (our present-day Gran Turismo cars) and also one of the great Italian style icons. Not to mention the fact that the Giulietta is one of the best examples of the unequalled technological and human heritage enshrined in the engines and styling of all Alfa Romeo models, past and present. It is no coincidence that we close this short history of the Giulietta with a present-day car inspired by its illustrious predecessor: the Alfa GT. This is the best example of the way both cars, though separated by time, are the outcome of the same engineering background and design creativity that have been a perennial reality for Alfa Romeo, an experience that is renewed every day. The story of the Giulietta is the story of a Make that celebrates its past legends but lives very much in the present, through its current products. Throughout the celebration period, therefore, the most glamorous and fashionable streets in Milan (from via Montenapoleone to via della Spiga, via Bagutta to Corso Como) will offer visitors a chance to see some great cars: these include the Alfa GT, the original sporting coupй; the Kamal, a concept car that expressed the idea of elegant sportiness in a unique form for its type - and the 8C Competizione, the prototype that broke the mould and pushed back the most fascinating boundaries of Alfa's sporting tradition. Spirit, innovation and an unmistakable sense of Italian style have always been values that forge a close link between Milan and Alfa Romeo. 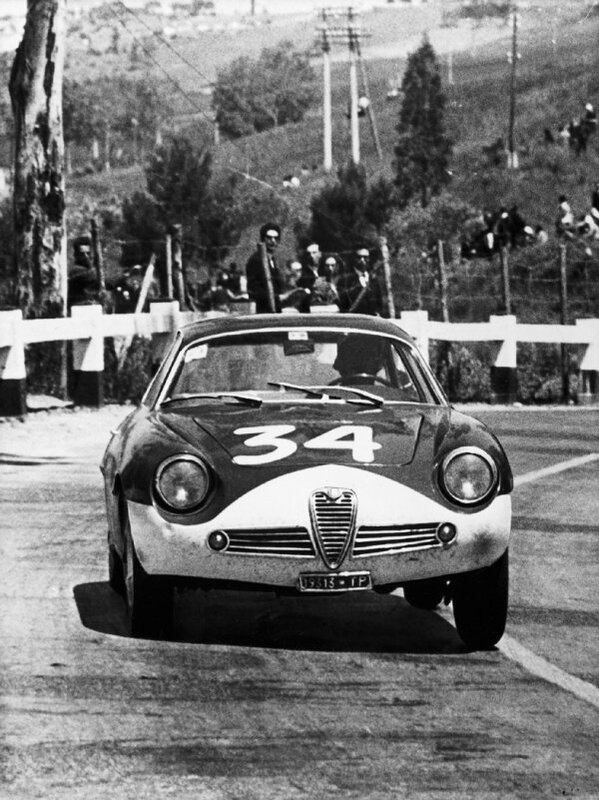 In this sense, the Giulietta Sprint's anniversary is a small part of another almost century long star-studded history of legends that thrill as much today as they did in the past - and will continue to do so in the future (Alfa Romeo is 94 years old on 24 June 2004). This is no academic reconstruction for nostalgic purposes, because passions for this car still run as high as ever. 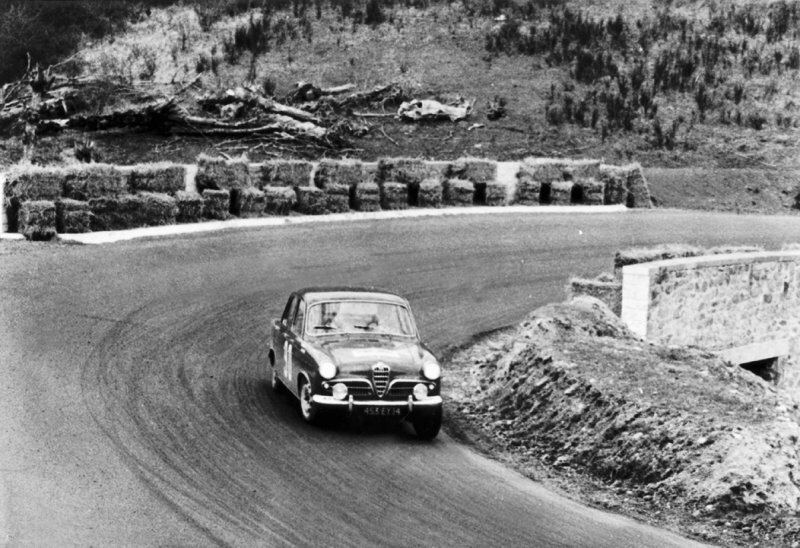 A recent estimate conducted by the Alfa Romeo Italian Registry found that 70% of the Giulietta Sprint cars built between 1954 and 1965 are still driven regularly. This means that tracing the history of this motoring legend also means paying homage to the best Alfa tradition, the same tradition that now inspires stylists and designers in their everyday work. The year was 1954 and cinemas throughout the world were showing 'On The Waterfront', a film directed by Elia Kazan that won 8 Oscars. The Oscar for best leading actor was awarded to a young and charismatic star: Marlon Brando. As one of the legends of international cinema was born, in Italy the public flocked to see the magnificent Sofia Loren in the film 'L'oro di Napoli' by Vittorio De Sica. But 1954 was also the year of 'La Strada' (winner of the 1956 Oscar for Best Foreign film) in which another great Italian actress achieved fame and international fortune: this was Giulietta Masina, wife of Federico Fellini, who played the part of Gelsomina, a poor and ingenuous girl, alongside Zampanт, the disreputable fire-eater magnificently played by Anthony Quinn. It may have been a coincidence, but the year that brought us the charming Gelsomina also welcomed a new Alfa Romeo that was to blaze its own trail through motoring history: its name was the Giulietta, the same as the famous actress who became its symbolic godmother in 1960 when car number 100,001 rolled off the Portello lines. The strand linking Fellini's films and the Giulietta reappeared in 1955 when the car promenaded along the sea front at Rimini (Federico Fellini's home town) to mark the Miss Italia competition, won that year by Brunella Tocci. 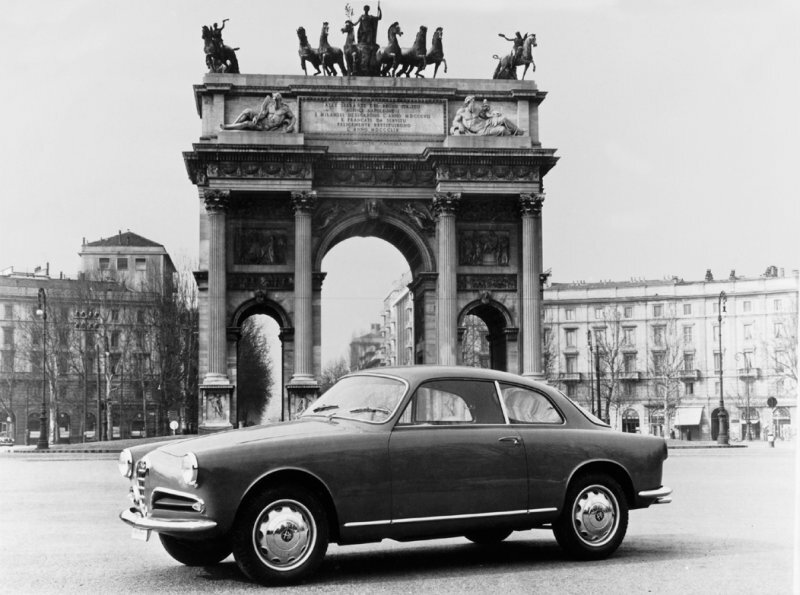 The Giulietta soon came to the fore as one of the symbols of the Italian renaissance after the ruins of World War II. After that it was but a short step to the status of veritable motoring legend. 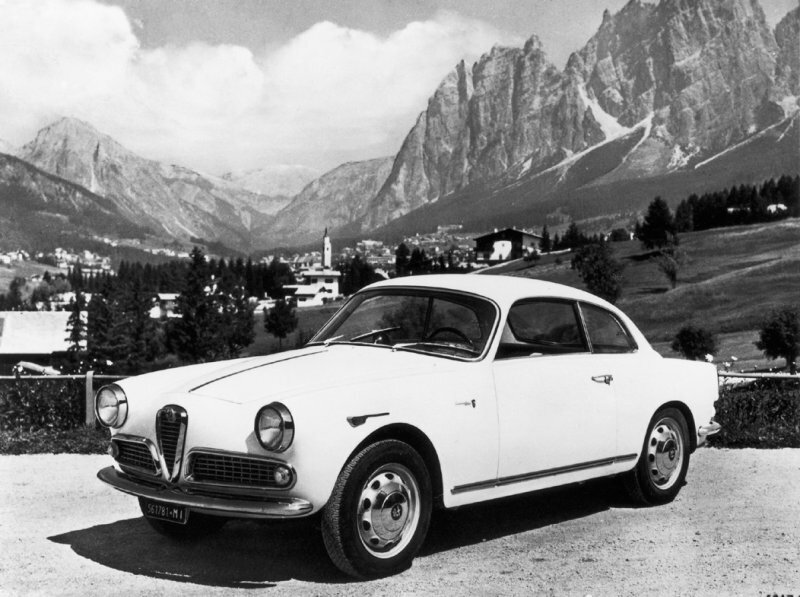 Any self-respecting legend is often shrouded in mystery and the Giulietta was no exception because two different tales are told to explain how it got its name. The first has it that the name Giulietta was suggested by Mrs De Cousandier, wife of the poet Leonardo Sinisgalli. The second, however, claims that it was Alfa Romeo's answer to a question from a Russian prince. 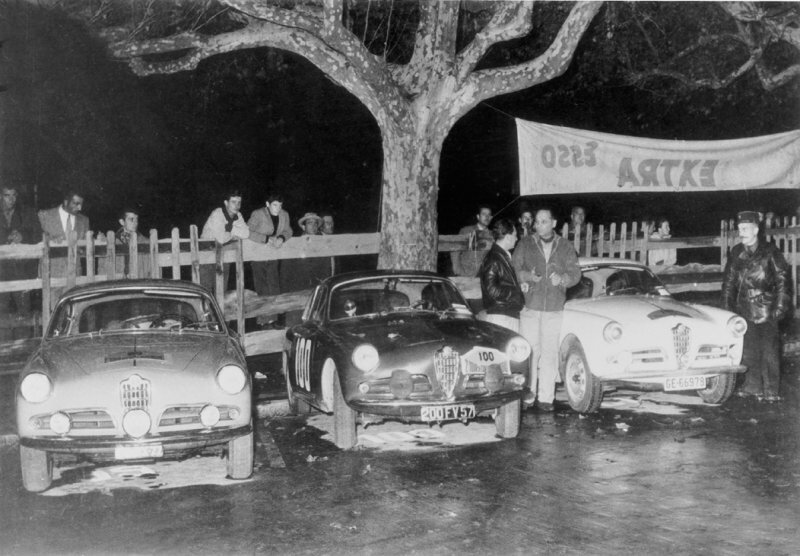 The story goes that one evening in 1950, at the time of the launch of the Alfa Romeo '1900' in Paris, the driver Wimille and some Alfa Romeo directors entered a nightclub where the noble prince was wont to entertain the customers with poems and stories. After recognising the directors, the prince went to greet them with the question: 'You are eight Romeo's without even one Giulietta?'. 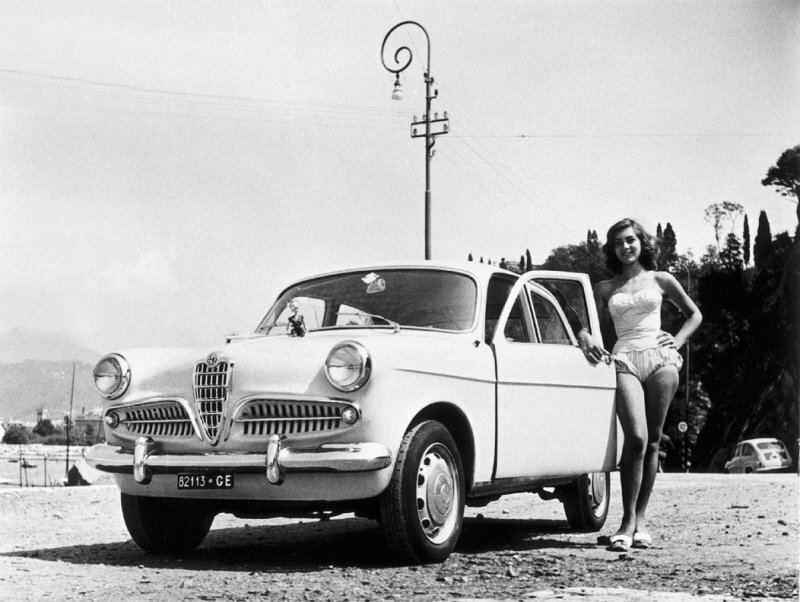 Three years later, (Alfa) Romeo introduced its Giulietta to the world. Whichever story is true, the Shakespearian reference appealed to the imagination of the entire world and the name of the young romantic girl who leans over the balcony in Verona to hear the words of her lover earned the Giulietta the name of 'the Italian girlfriend'. Now let us go back to 1954, when Nunzio Filogamo introduced the San Remo Festival for the fourth time in succession on the occasion when it was won by Gino Latilla and Giorgio Consolini with 'Tutte le mamme' (written by Bertini and Falcocchio) and bereft, for the first time, of the Queen of Italian song: Nilla Pizzi. The newspaper front pages were emblazoned with words of homage to Ardito Desio who on 31 July led an Italian exhibition to conquer K2, the second highest mountain in the world. Inside the papers, you could also read news of the 'Montesi' mystery and the arrest of Fausto Coppi for adultery: a photograph captures the cycling champion as he loads his bicycle into the boot of a Giulietta saloon. Between joy and sadness, Italy was rushing headlong into modernisation and just about to undergo its very first economic boom. One emblem of this crucial stage in the history of Italy was the Giulietta Sprint that made its debut at the Turin Motor Show in the spring of 1954 and was welcomed like a true film star. In the wake of the 1900's success, Alfa Romeo introduced a small, nimble coupй offering superior performance that marked its entrance to the small car category, i.e. cars equipped with power units of under 1500 cubic centimetres. The first thing that strikes you about the car is its slender body designed by Bertone that cleverly uses aerodynamic principles to ensure a stylish shape. At the front, the distinctive Alfa Romeo badge and side grilles had been adjusted to suit more modern tastes. What people saw was a brand new revolutionary twin shaft 1290 cc engine that benefited from extensive use of aluminium alloy, a truly unprecedented idea at the time. This engine, forerunner of all subsequent four cylinder engines, was designed by Giuseppe Busso in accordance with a philosophy of weight containment that came from his training as an aviation engine designer. It is not the first time that superior qualities of power and safety have been conferred on a car that was exceptional for its compact cylinder capacity and size. All these qualities allowed Alfa to maintain the attributes of handling and brio that won such acclaim in the 1900 but offer them at an accessible price. 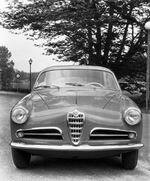 The result was the Giulietta Sprint, a coupй type-approved for 2 + 2 seats that remained in production until 1962. The three main car series were complemented by Sprint Veloce versions and the last car produced in 1962 that was called simply the '1300 Sprint'. 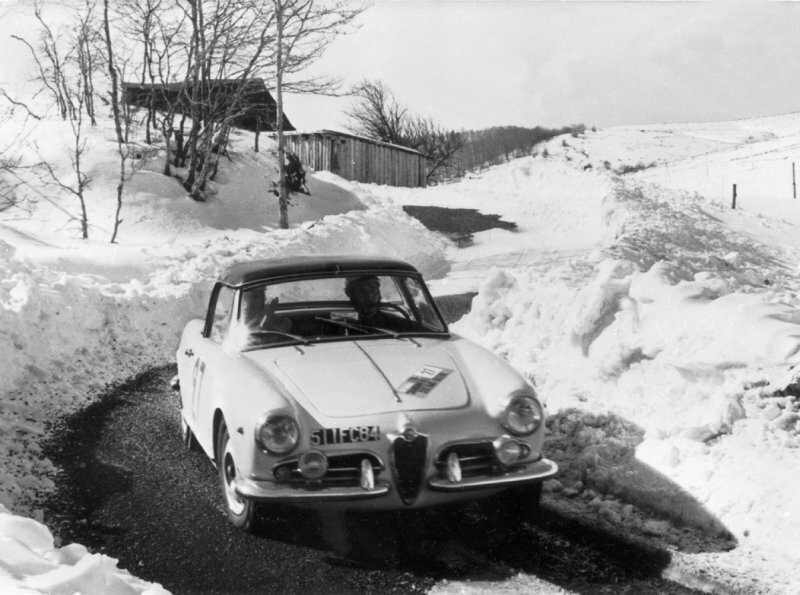 24,084 units of the Giulietta Sprint were produced in total; 3058 of the Giulietta Sprint Veloce; 1252 of the Giulietta Sprint Speciale - and 217 of the Giulietta SZ and the Giulietta SZ Coda Tronca. All versions of the Giulietta model represented significant icons of their day: the car starred in many films of the Sixties, the years of the economic boom and the Dolce Vita. It won everyone's hearts: from the man in the street, who certainly dreamed of it, to celebrities such as Sofia Loren, Gina Lollobrigida, Esther Williams, Diana Dors, Vittorio Gassman - and many others - who owned it. It became an emblem of social and economic growth in Italy and in the TV advertisements of those years, it was actually chosen to reinforce the benefits of other products. For example, Domenico Modugno shouted 'With API you flyyyyy! ', after filling his car at the petrol pump and speeding off in his Giulietta Spider. Its speed on the road was also reflected by the speed of its sales. 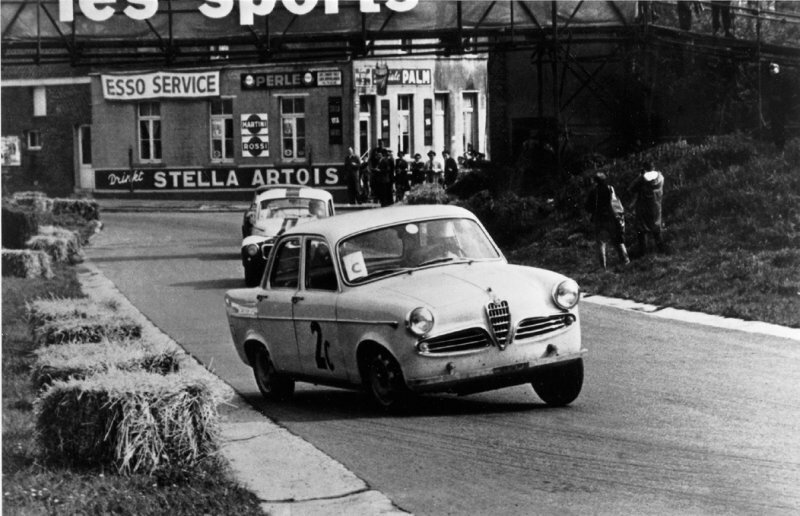 It may, therefore, be affirmed that the Giulietta invented a new class, that of the 1300 cc car, that would soon become a European formula. Not to mention the fact that in 1955, no other standard production saloon in the world offered the mechanical and performance specifications of the Giulietta. It taught us all something. Despite its years, this model still maintains a strong personality that confirms Alfa Romeo's great tradition. The same appeal was inherited by the Giulia, the natural heir to the Giulietta that continued to improve on its predecessor's already cutting-edge attributes and record breaking performance over the years. Alfa Romeo got off to a head start and has always maintained a distinct edge over the competition by producing medium-sized cars with performances that were entirely worthy of higher cylinder models and, in terms of handling, continued to learn from race tracks and circuits throughout the world. 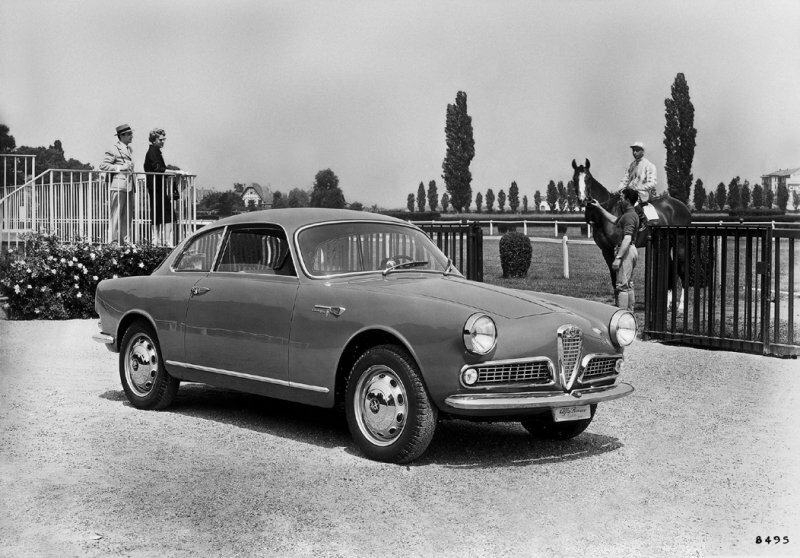 On 19 April 1954, the 36th Turin Motor Show opened and all the spotlights were on the Giulietta Sprint that had been presented a few days earlier in a shower of glory to the Italian press. When the curtains were lifted on the Turin show, a surprise was in store: the car on show was not the red 'Lotteria' prototype that had starred in a spectacular ceremony with costumed figures at the Portello plant. In fact the 'Giulietta Sprint' exhibited on the Alfa Romeo stand was painted Capri Blue and lacked a tailgate and external fuel filler flap. Now we need to go back in time. 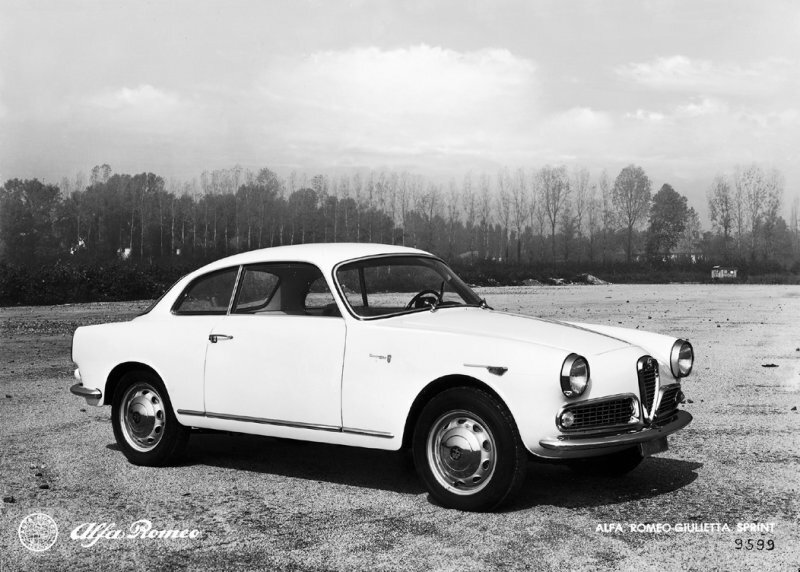 Everyone knows that the Giulietta Sprint's shape was designed by Carrozzeria Bertone but it is also true to say that more than one stylist contributed to the creation of the new coupй. 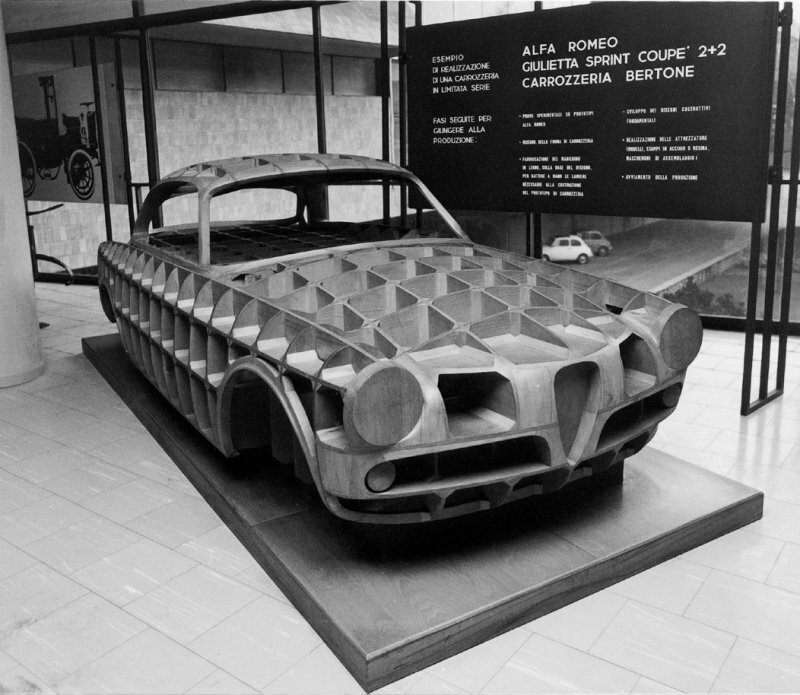 The initial configuration was the work of Giuseppe Scarnati, an Alfa Romeo designer who created and produced the first prototype at the Alfa Romeo Special Bodywork department between 1951 and 1953. But the result lacked something in the eyes of Francesco Quaroni, general manager of Alfa Romeo who brought in the stylists Mario Boano from Ghia and Franco Scaglione from Bertone. 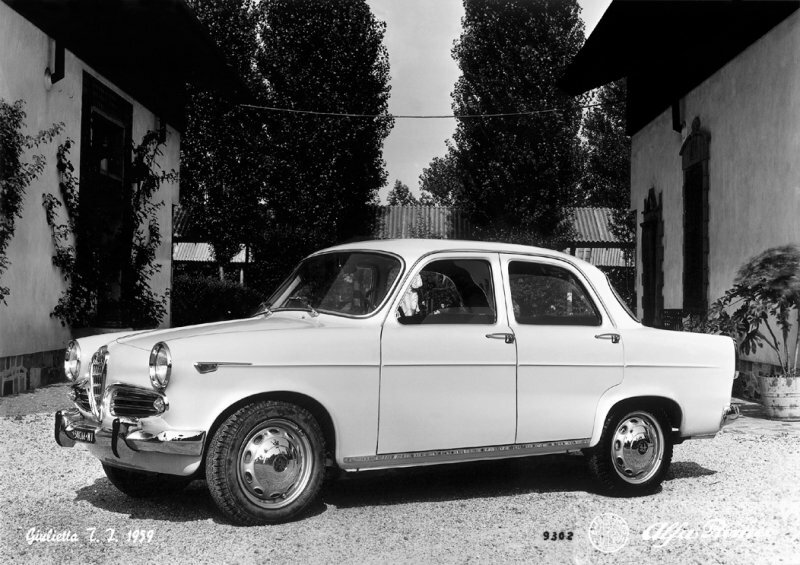 History records that both designers collaborated jointly on the first prototype but during the preparatory stage Boano moved on to run the newly set-up Fiat Style Centre and gave up the commission. At that stage, Nuccio Bertone dug in his heels and asked Quaroni if he could complete the design on his own. Bertone then, inspired by the legendary 1900 Sprint of 1951 and the subsequent Super Sprint version (the fastest two litre car of its day at 190 km/h), went on to design the Giulietta Sprint with a front end that harked back to the stylistic motif of the 1900 with a central grille like a mouth, air intakes like a set of moustaches. The tail-lights, on the other hand, featured smooth corners without a reversing light. In other words, although the idea of the Giulietta first arose within the company - an Alfa Romeo design group led by the engineer Orazio Setta began to set down ideas for the Giulietta at the end of 1951 - it is also true to say that the final version bears the unmistakable signature of Franco Scaglione from Bertone. 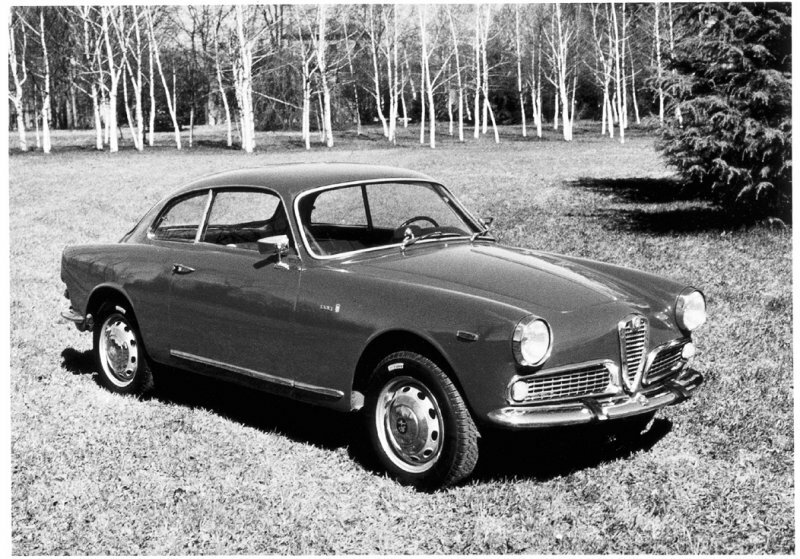 According to Alfa's plans, this appealing, sporty car was to act as a teaser to prepare people for the advent of the Giulietta saloon planned for the following year, because only very few cars were produced. 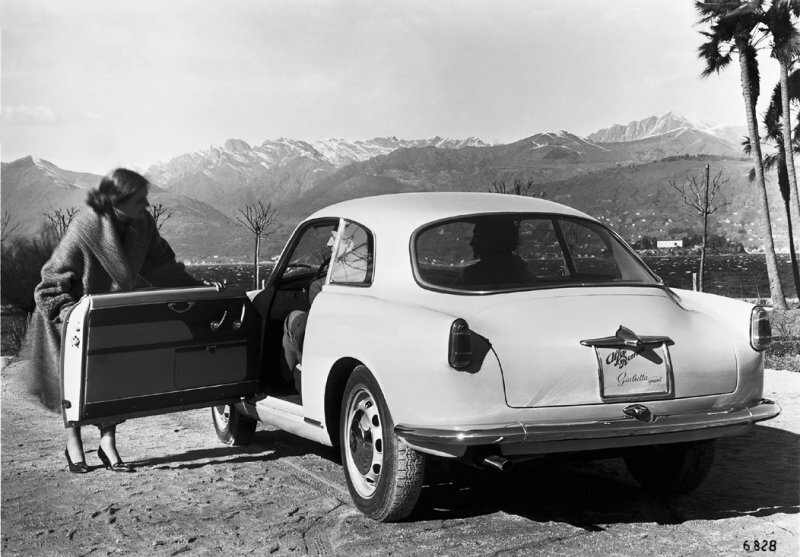 But the Giulietta Sprint received such a warm welcome that things did not turn out as intended: after the Turin Motor Show the Alfa Romeo dealerships literally came under siege. Now Bertone was really faced with a difficult task: his bodyshop in Corso Peschiera in Turin certainly was not able to satisfy a demand of this magnitude but the master still decided to take up the challenge. 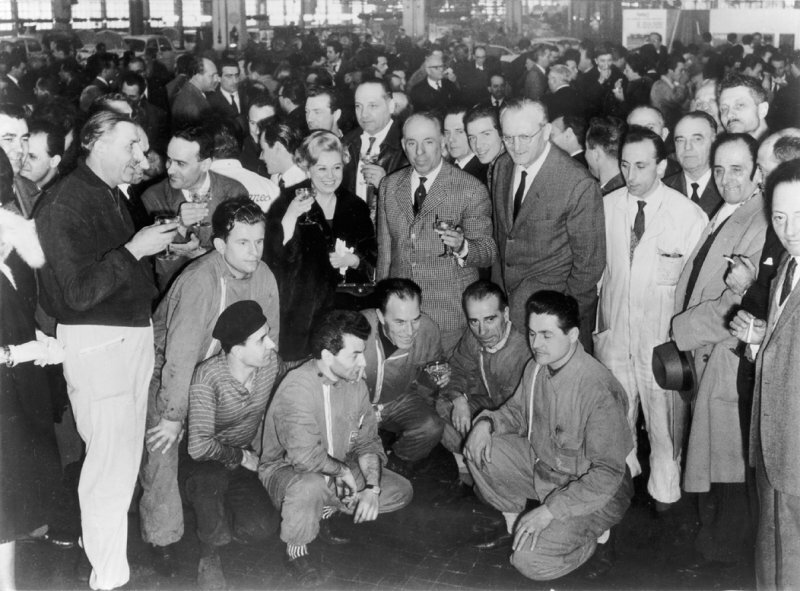 To face the extraordinary demand, Nuccio Bertone called on master panel beaters working at small Turin workshops who provided him with bodies partly beaten by hand on wooden dies and partly made up of pressed panels. For this reason, the first Giulietta Sprint units - only 12 vehicles were registered in 1954 - were truly one-off items because no two cars were the same. 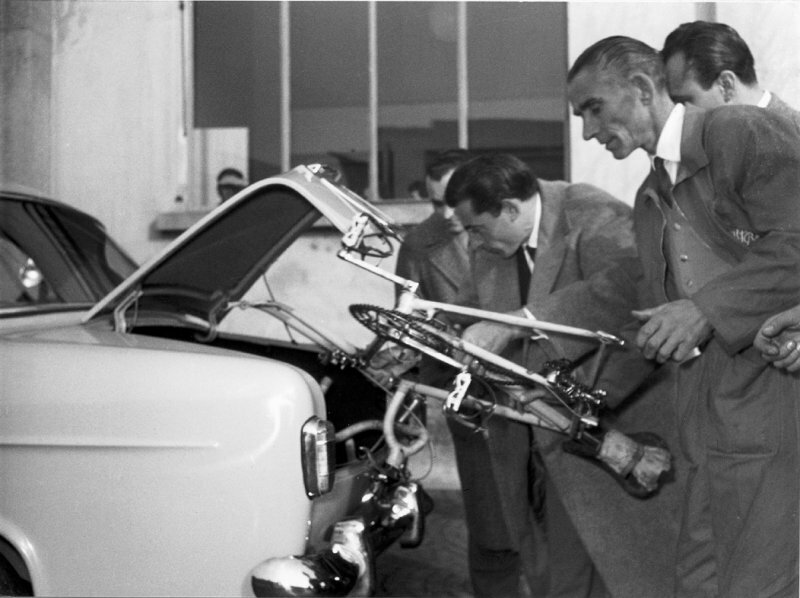 Despite these valiant and inventive attempts, the demand rose to unprecedented proportions and craft workmanship comes at a very high price: for this reason, in 1960 Bertone opened a new plant at Grugliasco on the outskirts of Turin and turned his acclaimed body shop into a world renowned industry. Now let's go back to the 1954 Motor Show. The forerunner of the Giulietta family immediately captured the attention of workers and public alike - and more than 700 orders were collected in the days of the Turin Motor Show alone. This was a real success when you consider that the price was more than 1,700,000 lire when a worker's monthly salary was around 40,000 lire and a television set cost 180,000 lire. Incidentally, Italian television is also celebrating its 50th birthday at the same time as the Giulietta Sprint. January 3 1954 was the official date on which RAI programmes began: about 4 hours per day received by nearly 24,000 subscribers to the new public service. In one year, 170,000 sets were bought. This figure rose to 350,000 in 1955 and exceeded one million in 1958. Italy was changing and the country was being brought up to date by the new communication medium that grew up with and documented this historical period. The economic boom was knocking at the door and formed the feverish background for the advent of the new Alfa Romeo coupй. Despite its small size (3980 mm in length, 1540 mm in width and 1320 mm in height) the car was striking for its clean, uncluttered external shape that was truly revolutionary for its time: it would not look at all out of place on the road today. The Giulietta Sprint's profile made it look as if it was born to race: the only decorative detail on its streamlined body was a chrome strip on the doors. This sporting vocation was reflected inside the model: a Spartan steel dashboard included the speedometer, mileometer and trip counter, rev counter, pressure gauge and oil temperature gauge, fuel level gauge and water temperature gauge. And so from styling to the mechanicals. 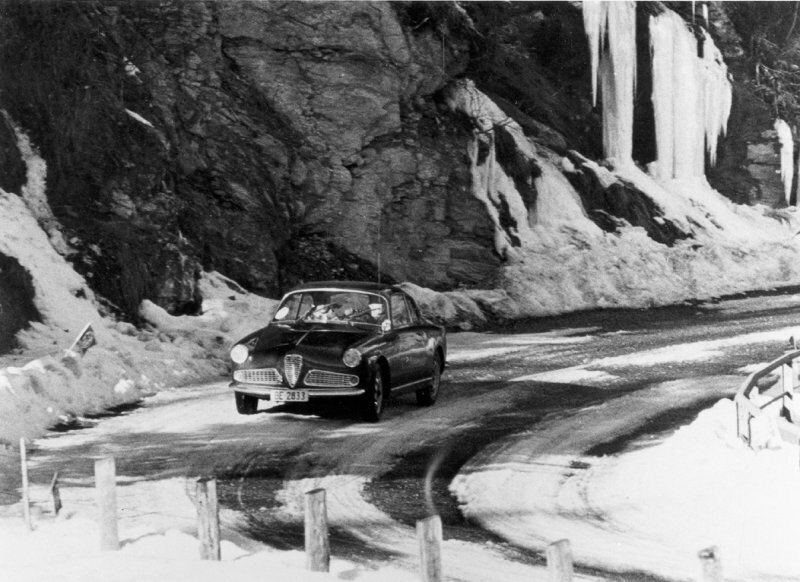 Because the car's wind-swept shape was complemented by cutting edge specifications including an ultra-new 1290 cc power unit that developed a maximum power output of 65 bhp at 6000 rpm and propelled the model to a top speed of 165 km/h: the Giulietta Sprint was the fastest car in its category. In detail, the 1.3 litre 'four-cylinder-in-line engine' was made out of aluminium (an absolute first for the motoring world) as was the gearbox and differential casing. The cylinder liners are press-fitted in special cast iron. The valve system was a twin overhead cam configuration (unique for a small power unit at that time) while the crankshaft was mounted on five bearings. The rear-wheeled drive car was also noteworthy for its gear shift on the steering wheel (a clutch lever became available as an alternative in 1957) and the pull-on handbrake located beneath the facia to the left of the steering wheel. The front suspension was also independent with coil springs, wishbones and stabiliser bar. The rear suspension was independent with coil springs, upper wishbones and struts. Braking was assured by four drums produced using a special Alfa Romeo casting procedure. With its searing performance and excellent on-road behaviour the Giulietta Sprint was the best that the car industry could offer at the time. Its attributes were rounded off by a range of options that were absolutely unique for the day: a set of suitcases with straps to fasten them to the cushions of one of two rear seats (a divan-type rear seat was available as an alternative); fog lamps and radio; imitation leather trimmed dashboard and upholstery in real leather; side air deflector and a three-spoke aluminium steering wheel with wooden rim. The colour range was also extended by new names: Iseo Blue, Capri Blue, Alfa Red, Gardenia White, Black, Pale Green, Very Pale Blue, Very Pale Grey, Banana Beige and Winter Blue. When the customer chose one or more options, the car was customised with a chrome ring inside the Alfa Romeo badge on the boot. 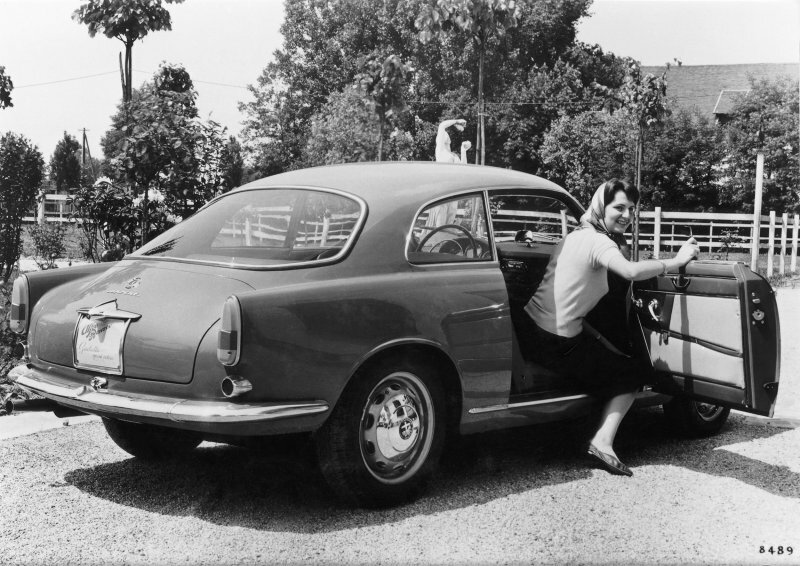 It took a few short months for the Giulietta Sprint to become a runaway success, ready for launch in the United States with the America specification. Unlike the European specification, the exterior was identifiable by a chrome ring that outlined and separated the small tail-light clusters and a chrome strip adorning the two side whiskers on the front grille. Inside, the Sprint America offered a speedometer calibrated in miles instead of kilometres. One titbit of information: a prototype appearing at the Paris Motor Show in the autumn of 1954 was given the name 'Manuals' because it had been used in August of the same year to produce owner handbooks and also for official photos. Two years after the debut of the Giulietta Sprint, Alfa Romeo offered us another international first - again at the Turin Motor Show: the Giulietta Sprint Veloce (Series I). From an aesthetic point of view, this differed from the Giulietta Sprint only in its identification codes. The same did not, however, apply to the mechanical system and performances. Compared to the Sprint, the new version could be identified by the addition of two Weber carburettors and lighter mobile body and bumper parts, now produced in aluminium. And there is more, both the rear window and sliding side windows (descending on the Sprint) were made in Perspex and fitted on aluminium frames. The circular rims around the front headlamps were also in aluminium. Inside, the trim was even more spartan than that of the 'Sprint': recessed door lining, glove compartment without a door, simplified more wrap-around seats. 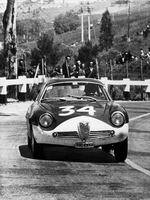 Altogether, the Giulietta Sprint Veloce was more than 72 kilograms lighter (its kerb weight was 780 kg). The car may have been lighter but its power unit was more powerful. 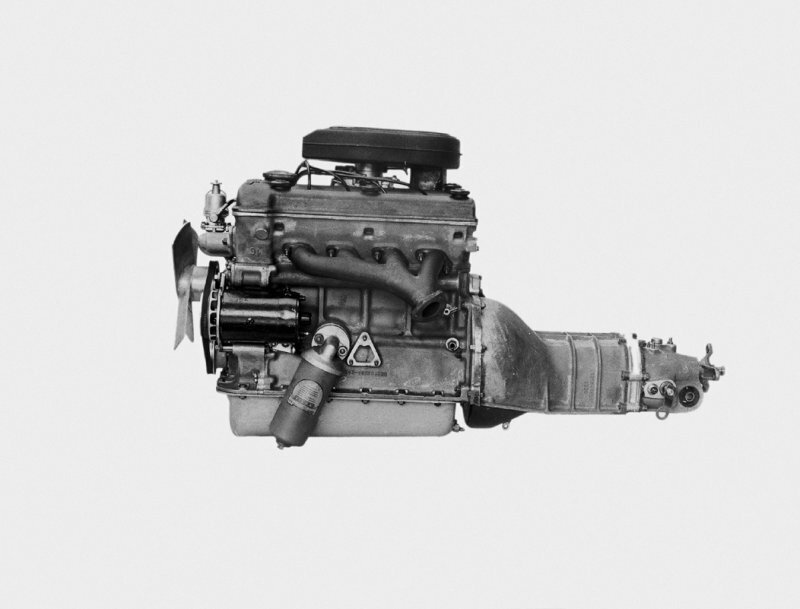 The Portello engineers had worked directly on the 1.3 litre engine to increase the maximum power to 80 bhp at 6500 rpm (this was to become 96 in Series II of 1959). This was achieved by a higher compression ratio, a new valve gear with different camshaft timing, brand new single intake manifolds equipped with two double barrel Weber 40 DCOE3 carburettors supplied by a Bendix electric fuel pump. Once modified in this way, the 4 cylinder engine was less flexible but its rpm level rose with considerable ease to a top speed of 170 km/h (175 for the Series II in 1959). The powerful, impetuous Giulietta Sprint Veloce was born to go fast and satisfied a wide array of customers who wished to race it. 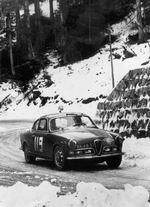 And they proceeded to do just that in the Fifties when the Giulietta SV took part in all the most famous races such as the Mille Miglia, Targa Florio, Tour de France and the Sestriere Rally. The car really showed its colours and even beat cars with bigger engines. These inspiring results prompted the interest of customers who had no intention of racing but were looking for a thoroughbred sports car. Alfa Romeo satisfied them in September 1957 by introducing a version more like a touring car that was officially known as the 'Confortevole'. The new car was produced in a limited series (about 200 examples) and combined the specifications of the Sprint Series I and the mechanical configuration of the 'Veloce'. On the outside, the Giulietta 'Confortevole' could be recognised by Perspex descending window (with an aluminium frame) and its bigger headlamps. In April 1955, the Giulietta Saloon appeared on the market. For the first time, a 'sprint' model of clearly sporting vocation became a standard production model able to satisfy customers who were looking for a small, practical car but still did not wish to give up the performance typical of a sports coupй: the result was 'the family car that wins races'. In the hands of champions it could meet the most demanding challenges while, as a slogan of the day had it, 'mum could drive it too'. A new age had begun and Alfa Romeo was one of the first to bring the satisfaction of a sporting drive within the reach of all. In October of the same year came the turn of the Giulietta Spider, 'the signorina' as it was affectionately called by Gian Battista Farina who designed its streamlined shape to give it a strong personality of its own. 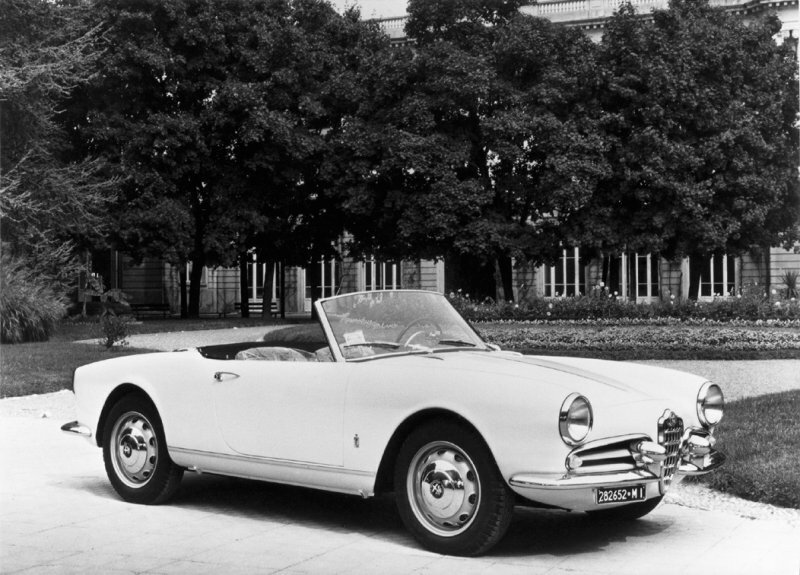 The Giulietta Spider was built on a Sprint floorplan but with a short wheelbase and won international success. It was enthusiastically greeted in the United States where the motoring press deemed it: 'a splendid continuity of the Italian tradition of good taste that means you can pick out an Alfa Romeo from a thousand other cars at a glance'. 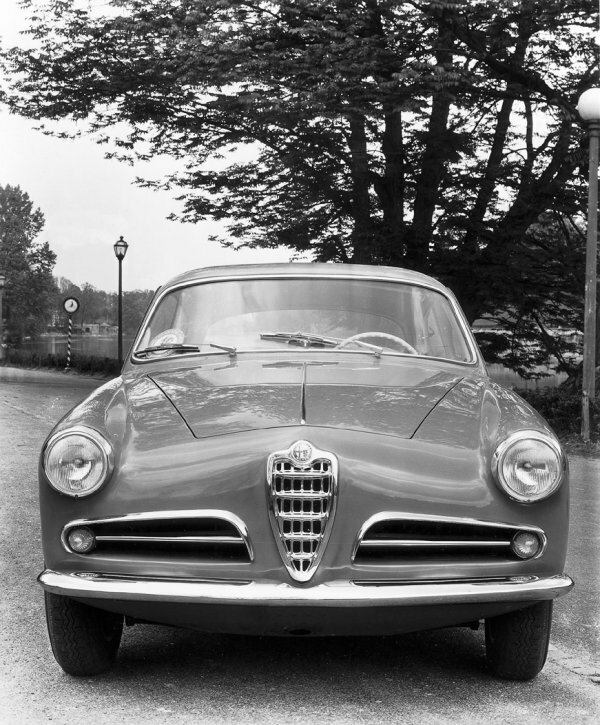 Now we have reached 1957 and the launch of the Giulietta Sprint Speciale, the result of a profitable joint venture between Alfa Romeo and Carrozzeria Bertone. The vehicle offered a 1.3 litre power unit developing 100 bhp at 6500 rpm (top speed 189 km/h) combined with a gearbox with 5 synchronised ratios. Compared to the Giulietta Sprint, the SS version was 412 cm long, 166 cm wide with a wheelbase of 225 cm. 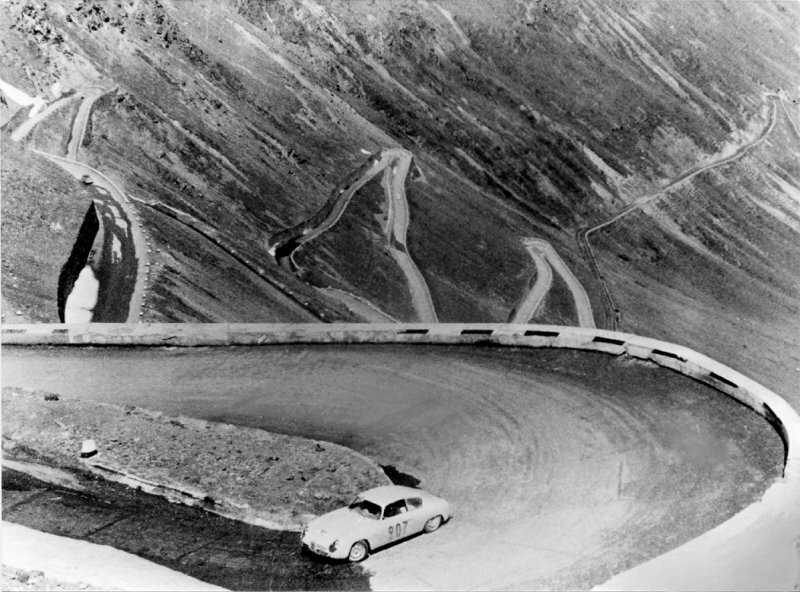 The shape of the Giulietta SS, with its low, penetrating profile, was the result of aerodynamic studies performed on the Milan-Turin motorway. The car was half-covered with woollen strands so that it could then be photographed and filmed by a car travelling behind. In this way, the air vortices that arose in certain areas of the body were revealed by tangled threads. This meant the stylist could alter the overall shape for a smoother line with the best possible aerodynamic performance. One evening, toward the end of August 1958, Federico Fellini organised a dinner to which he invited Tazio Secchiaroli, Carlo Bavagnoli, Pierluigi Praturlon, Sandro Vespasiani, Ezio Vitale, Guglielmo Coluzzi and others. These were the Via Veneto photoreporters, the 'paparazzi' who reigned over the vibrant Roman nights ready to steal pictures, stories and sensations to sell on to newspapers. That meeting was the inspiration for 'La Dolce vita'. At the end of the Fifties, Rome was the capital of cinema and the international jet-set: Via Veneto hummed with life, the chic nightclubs and luxury hotels attracted actors and writers while politicians and VIPs met at the tables of fashionable cafйs. A kaleidoscope of languages, music, scents and colours. These were the images that attracted world attention to Via Veneto, the city of Rome and also Italy, a country that was forcefully emerging from the difficult post-war years. The economic boom was exploding: widespread prosperity led people to rediscover their joy of life and experiment with art, design, television and fashion. And more. 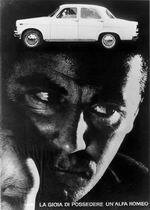 The Fifties were also a never-to-be-repeated period in the history of the motor car. Alfa Romeo was an indisputable star among motor manufacturers, due to the class, elegance and sportiness of its models. They were called 1900 Sprint, Giulietta Sprint and Giulietta Spider and they sped like arrows over the roads of Europe with style and sophistication: just like true divas of stage and screen. Our memories immediately return to those fabulous beauties Sofia Loren, Anita Ekberg and Brigitte Bardot but also actresses who were more famous for their ability to express empathy and intensity such as Anna Magnani and Giulietta Masina. 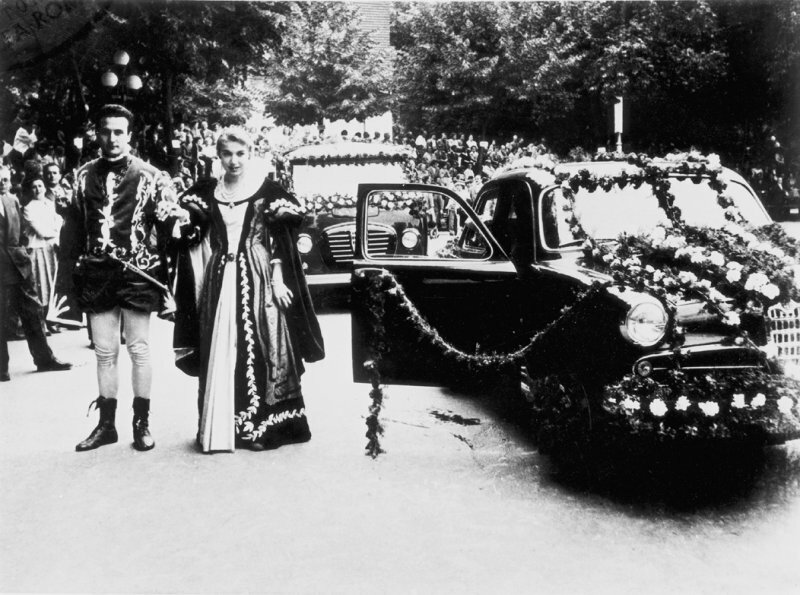 Fellini's wife, the Giulietta's godmother, was the person chosen in 1960 to greet the arrival of car no. 100,001. The 'Dolce vita' years were also the years when Italian fashion began to make its name throughout the world. The period now known as Italian Glamour saw the light at that time. The Dolce Vita was associated with values that blended the identity and appeal of Italy in terms of everyday aesthetics, the quality of food and wine, taste, imagination and an ability to live life well. But the main attractions were class and elegance. An Italian elegance that Alfa Romeo was able to combine with sportiness. 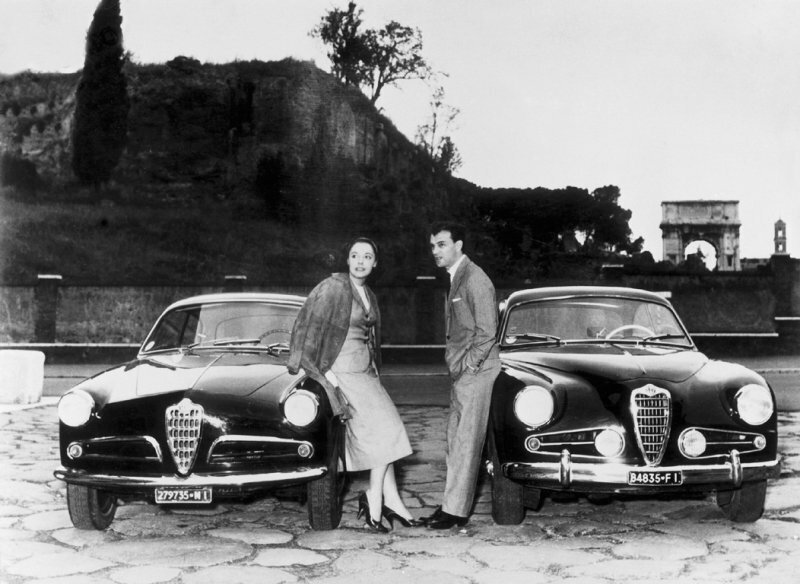 The Giulietta Sprint represented the perfect marriage between these twin, so apparently contradictory spirits that achieved a magical balance in Series II of the model. On 24 June 1958, the Giulietta Sprint Series II was presented at the Monza racetrack and given the name of the 'Monza prototype'. The event assumes particular significance when we remember that this restyling was created by the hand of Giorgetto Giugiaro, by then established at the Bertone Style Centre. The celebrated designer added few but telling aesthetic details that particularly affected the area at the front: the air intakes were taken into a single grille, the headlamps were bigger and side turn signals were added. New tail lights were added with a separate reflector and the number plate lights were included in the bumpers (to fulfil the requirements of the new 1958 highway code). The engine was the classic 1.3 litre unit upgraded to 89 bhp due to the addition of new exhaust manifolds, a strengthened cylinder block and oversized valves. The gearbox also adopted Porsche type synchronisers and a clutch control. A few months later, however, at the official launch in 1959, the workers discovered certain changes had been made to the Monza prototype: for example, the reversing lights were white (previously they were orange) while the seats came in a new shape and were upholstered in a checked cloth fabric. Engine power was increased to 80 bhp at 6300 rpm and the top speed was 170 km/h. While few differences were apparent on the outside, the thing that really changed was the way the body was built. The early years of practically handcrafted construction were followed, in the summer of 1960, by the opening of the new Bertone plant in Grugliasco (Turin) where bodies were assembled with electric spot welding to join panels entirely produced in presses. The same period saw the introduction of the Giulietta Sprint Veloce Series II that benefited from the same aesthetic changes but without the lighter body and was fitted with a 1.3 litre engine developing 100 bhp at 6500 rpm that sped to a top speed of 174 km/h. Lastly, the 5 speed gearbox developed for the Sprint Speciale could be fitted as an option at an additional price. The Alfa Romeo legend was created mainly by the sporting triumphs that accompanied the Make throughout its history. Alfa's many successes make a long and fascinating story on their own, a story of men and their competitive passion, engines and cutting-edge engineering. It would be impossible to condense the history of successes notched up by the red racing cars produced in Portello over a thousand roads and as many circuits into a few short pages. Taking a look at just a few of these pages of sporting history as played out by the Giulietta Sprint could help us to appreciate the unparalleled heritage of engine and mechanical engineering that brought us the good looking thoroughbred cars we know today and exactly how the legend was formed over the years on the demanding testbed of the race track. One of these pages of history should be devoted to the bodybuilder Elio Zagato who, upon a request by the driver Massimo Leto di Priolo, rebuilt a Giulietta SV that had been destroyed in a race. The Milanese master brought his own absolutely personal approach to the shape and, above all, to the use of the materials used to create the body and moving parts. He replaced almost all the steel with a light alloy that allowed him to keep the car's weight within 854 kg, the limit set by the racing regulations for the Gran Turismo Category (reduced to 840 kg in 1962). 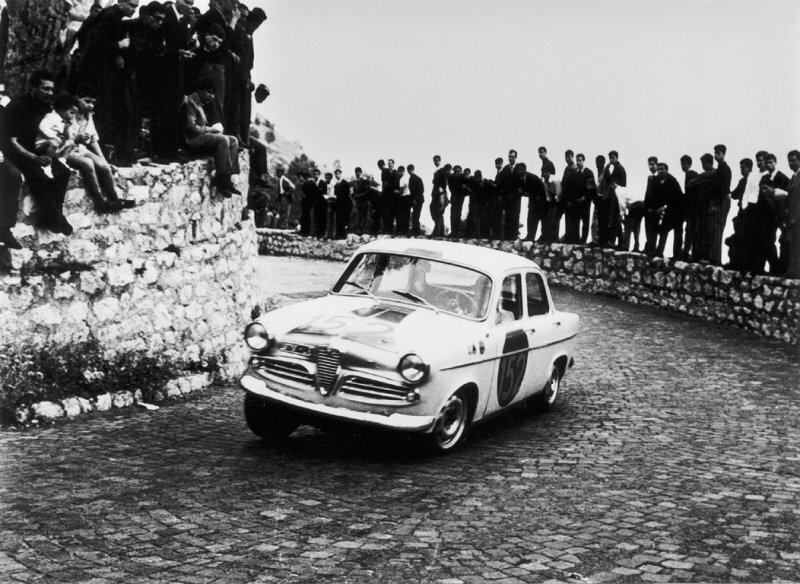 The resulting prototype made its debut at Monza in the Intereuropean Cup of 1956 and scored an outright victory. Alfa Romeo liked the car and commissioned a few more units. 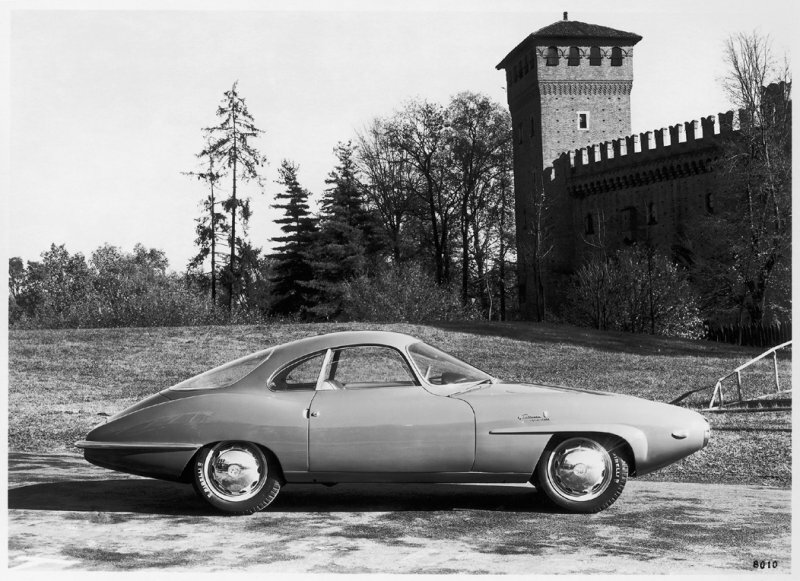 Between 1960 and 1961, therefore, we saw the production of the Giulietta SZ that differed from the Sprint Speciale version in its outward appearance while offering the same mechanical configuration and engine: it measured 392 cm in length, 154 cm in width and its end was slightly convex. 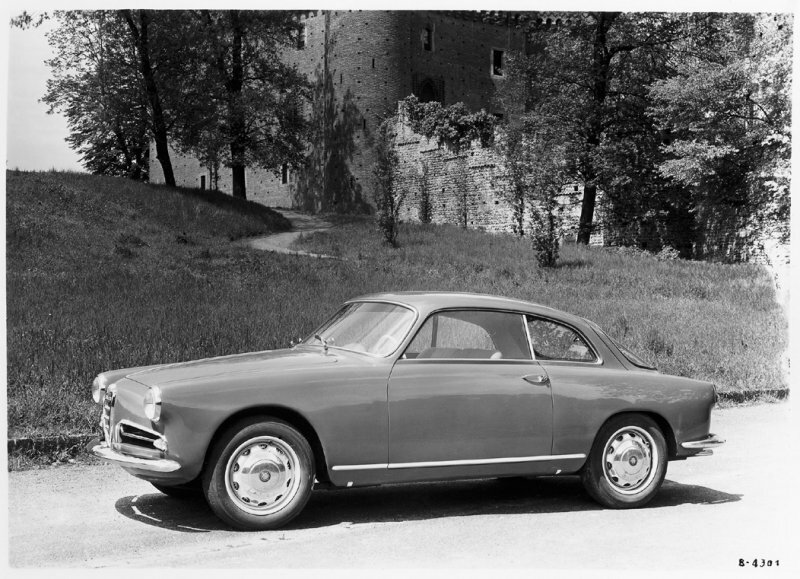 Then, between 1961 and 1962, the plant produced the Giulietta SZ Coda Tronca: the body was even lower (height reduced from 125 to 123 cm), the front brakes were disc type and the shape ended with a cut-off tail complete with panoramic rear window. This version touched a top speed of 200 km/h. The car was 8 centimetres longer and 4 centimetres narrower than the SZ. In total, 217 examples of the Giulietta SZ were produced. Zagato's work was not the only thing that helped to create the legend of the Giulietta Sprint as a thoroughbred sports car. We may remember, for example, the Sprint Veloce raced by the driver Rabino from Modena that was completely revised by Sergio Scaglietti, the Ferrari body worker. Or the Giulietta Special, nicknamed the Drop due to its streamlined shape, produced by the Michelotti bodyshop and the engine tuner Conrero for the driver Francesco De Leonibus that achieved a top speed of 272 km/h on the Monza race track. 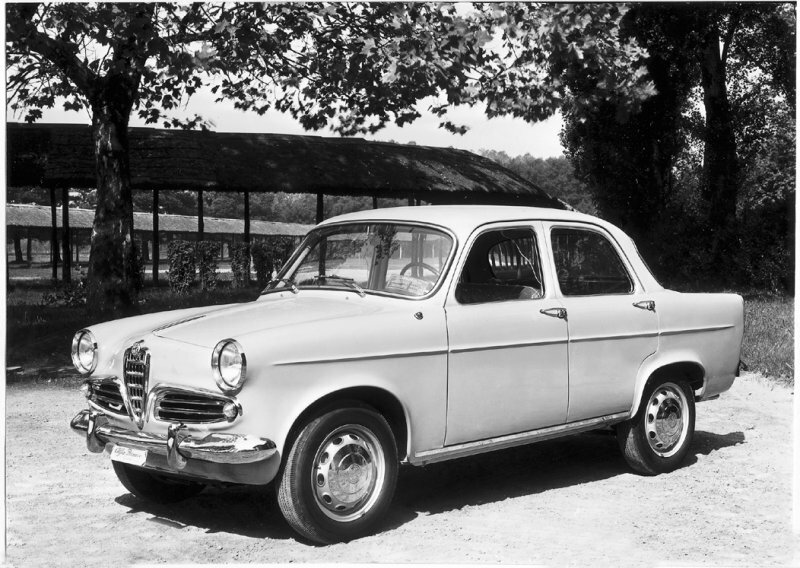 This short history of the Giulietta ends in June 1962 when the model changed its name and cylinder capacity. The Monza race track was the site chosen for the launch of the Giulia 1600 Sprint, i.e. a version of the Giulietta Sprint with a 1570 cc engine developing 92 bhp at 6200 rpm that could achieve a top speed of 172 km/h. The Giulia Sprint 1600 could be said to be a perfect marriage between a new, more powerful mechanical configuration and the evergreen shape of the Giulietta. 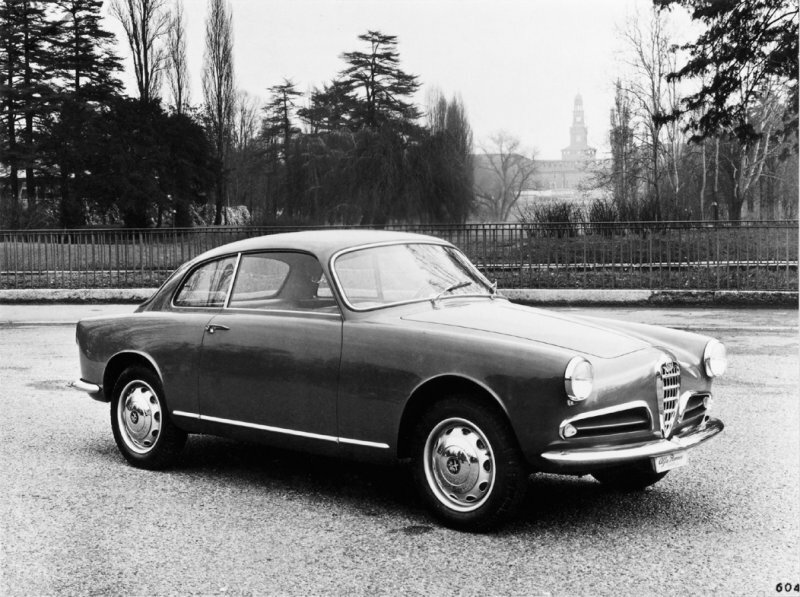 The differences between this and the second series of the Giulietta Sprint were few: for example, a new design for the bonnet and side turn signals, now rectangular, while the door panels were entirely trimmed in imitation leather and the brake drums were oversized. The wording 1600 of course appeared on the sides. Inside, the facia was almost fully redesigned, trimmed with imitation leather and completed with new temperature and air adjustment controls. The seats were also new and more comfortable and the brand had a new steering wheel which was still in black bakelite but with three aluminium spokes. From the first half of 1963, the instrument graphics were changed to feature a striking black face. The Giulia Sprint 1600 remained in production up to 1964 by which time more than 7100 units had been produced. The Giulietta's history also includes a truly rare departure for the field of motoring. When production of the Giulietta Sprint was already completed, Alfa Romeo restarted production to assemble more than 1800 units to the end of 1965. The car introduced for the first time at the Geneva Motor Show in 1964 was known simply as the 1300 Sprint, i.e. the name Giulietta was missed out. But the shape, cylinder capacity and two-spoke steering wheel were unmistakably taken from that glorious model. This particular version borrowed from the Giulia 1600 Sprint its distinctive row of instruments and also side turn signals plus the same brake configuration with discs on the front end. The wording 1300 also appeared on the sides and bonnet. Alfa Romeo has written many of the most important chapters in the history of motoring. The leading players in this story are the cars, the designers, the races and the engines that were the stars of technological progress and motorsport events in the Twentieth Century. This is the common strand that links all Alfa models, a venerable gene pool of engineering features and styling cues that are critically reappraised and reinterpreted whenever a new car is created. Now, as then, the Alfa Romeo designers and engineers work to design and build good looking cars that are full of character, to achieve the elusive balance between reason and sentiment, between engineering culture and design creativity. The finest expression of the inimitable personality that makes a car bearing the Alfa Romeo shield stand out from all others on the roads. And the Alfa GT is no exception. The new sports coupй is a quintessential example of Alfa's creative vitality and its exclusive understanding of cars. It is no mere means of transport but a car able to give its driver true sensations and break through the confines of necessity to the field of pure emotion: aesthetic taste, a passion for sophisticated engineering, the sheer pleasure of sitting behind the wheel and an expression of one's own personality. The Alfa GT also succeeds in packing the results of Alfa's superlative engineering heritage into a shape inspired by a sense of style and flair that could only be Italian. The stylists were also able to call on a great Alfa Romeo tradition that has brought us models that, particularly within the GT category, remain benchmarks of their kind: from the 1900 SS to the Giulietta Sprint, from the Alfetta to the Giulia Sprint GT. Show, this extraordinary coupй is a stylistic development of the Giulietta Sprint. The car is more compact due to its slightly shorter wheelbase and features a penetrating shape hardly interrupted by a bumper outline, with light clusters embedded in the grille and tail end. The Giulia Sprint GT was equipped with a 103 bhp 1600 engine and could carry up to four people. It remained in production until 1966 and sold more than 22,600. The car's roomy passenger compartment, generous luggage compartment and quality interior made it a top-class saloon, but with an unsuspected sporty temperament. So much so that the UK magazine Car and Driver wrote: 'Driving this car is sheer enjoyment'. It was not coincidental that the famous GTA logo was seen for the first time on a subsequent version of this model. Now we have reached 18 February 1965, the year when Autodelta presented the Giulia Sprint GTA coupй at the Amsterdam Motor Show, where A stands for 'alleggerita' or lightened. The outer body was the same as that of the GT, but the interior trim was made out of Peraluman 25, a light alloy of aluminium, manganese, copper and zinc. The new car differed from its sister externally in the addition of front air intakes, handles and the triangular Autodelta badge. The Alfa GT is the true heir to this car of the early Sixties that met with such great commercial and sporting success. The same could be said of another two versions of the model: the Giulia saloon TI and the Giulia Super 1600. An advertising slogan of the day said that the TI was the car 'designed by the wind'. The shape was revolutionary: low front enclosed by four headlights, plunging bonnet, a windscreen as small as that of a fighter aircraft and, above all, a cut-off end. The engine was a 1570 cc unit capable of unleashing 92 bhp. 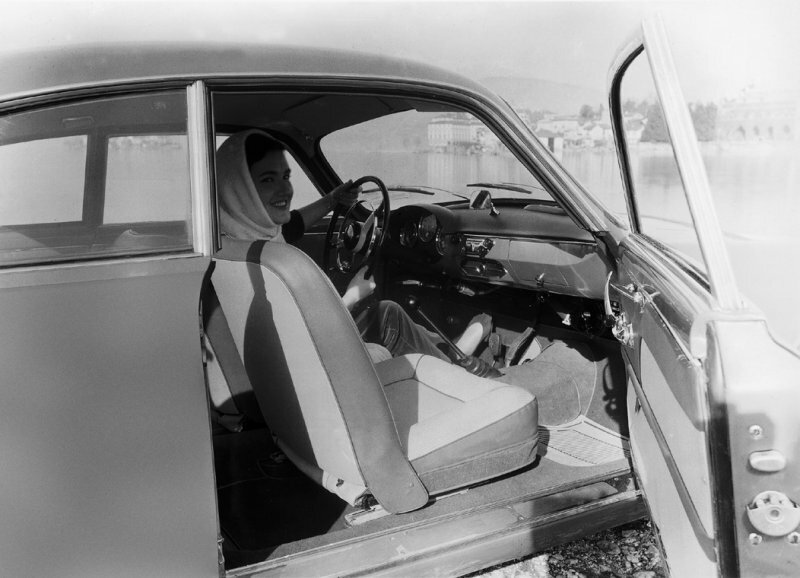 Then came the Giulia Super 1600 of 1965, featuring padded, wraparound seats and a facia with a wooden dashboard. The car was also fitted with a chrome strip beneath the doors and stainless steel bumpers. All these trappings disguised considerable power and torque: 98 bhp and 13.3 Nm. Like the Giulia Sprint GT before it, the new Alfa Romeo model harks back to another prestigious car: the Giulietta Sprint designed by Nuccio Bertone in 1954, the car that many consider to be the forerunner of present-day sporty Gran Turismo cars. A top speed of 165 km/h made it the fastest car in its category. One year later, at the 37th Turin Motor Show, came the turn of the saloon: 1290 cc cylinder capacity, 53 bhp and 140 km/h top speed (rising to 62 bhp and 145 km/h in 1962). Nothing could beat it in its market category at the time and motorists knew it. For about ten years, the Giulietta - in the form of the Sprint, Saloon and Spider - continued to exert the same appeal and increased Alfa Romeo sales from tens of thousands of units to hundreds of thousands. Although its cylinder capacity and dimensions were small, the model deserves a place in the history of Alfa Romeo sports saloons for the way it was able to interpret the contemporary motoring zeitgeist: the uncluttered, appealing lines of a coupй, state-of-the-art mechanical units, power and roadholding. The third reference point for the new Alfa GT sports coupй was the Alfetta, with which it shares its original styling, whereby a compact external shape conceals optimum passenger room and a luggage compartment measuring more than half a cubic metre. The Alfetta saloon went on sale in 1972 and immediately became an icon of the decade. It owed its success to its excellent design, which combined an appealingly mettlesome style with a lively engine, sophisticated mechanical units and great production quality. 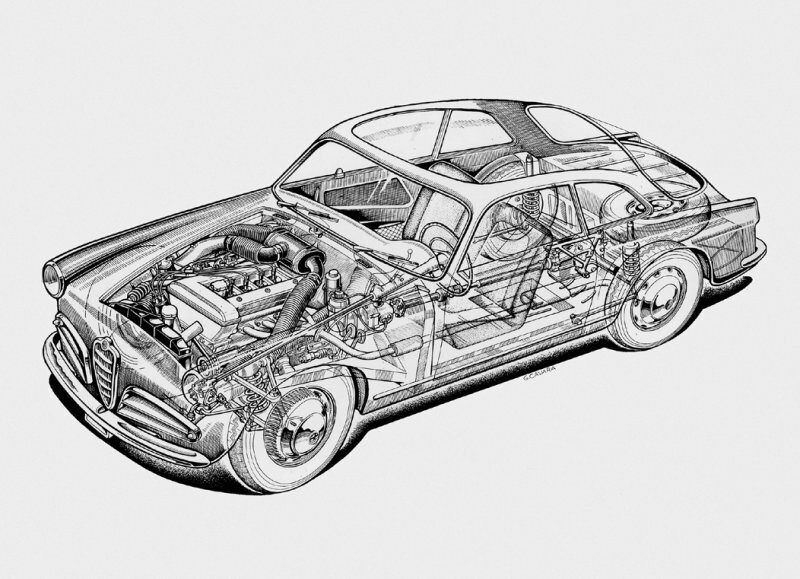 The engine was a tried and tested 1.8 twin shaft four cylinder unit of 122 bhp capable of carrying this car, which weighed just over one thousand kg and measured 4.28 metres long, to 180 km/h. In 1975, the model range was extended to include a version with a 109 bhp 1.6 engine (identifiable from the outside by its front end with just two headlights) while the 1.8 underwent a couple of changes. The Alfetta 2.0 that appeared two years later was something else entirely: the redesigned front end was ten centimetres longer; the headlights had become rectangular and other changes had been made to the grille, bumpers, tail-lights and - naturally - the interior. The facia was more linear (it was also walnut trimmed on the 2000 L from 1978) and the upholstery and door panels were in fine cloth. The steering wheel, seat profile and instruments and controls were also different. The bigger capacity made the car easier to handle and ensured the Alfetta was one of the best balanced cars in its category. After 1979, it also became the first turbodiesel saloon to feature a cylinder head divided into four parts, one per cylinder. We will close this brief review of cars that inspired the new model with the 1900, in particular the two Sprint and Super Sprint coupй versions that reached a top speed of 190 km/h. Apart from anything else, when Alfa Romeo launched the 1900 in 1950, it invented the 'sports saloon' and the model became the first Alfa with a load-bearing body. The result was, according to a apt slogan of the day, 'the family car that wins races'. Above all, it introduced the idea of a new motoring concept: a high-performing saloon for everyday use. In some ways this four-doored saloon heralded the styling of the Giulietta. It was very roomy inside and could accommodate five people, plus a child on the front seat because the gear-lever was on the steering wheel. This was a family car, yet it came with an effervescent 1884 cc four cylinder in-line engine that offered the driver 90 bhp. This model took Alfa Romeo to success in sporting competitions: the Tour de France, the Targa Florio, the Stella Alpina and the Coupй des Alpes. Altogether, the Alfa GT offers a deliciously nostalgic taste of these four famous models, yet packaged in an up-to-the-minute shape. Attention to detail is also its most telling attribute. Going back to the past does not necessarily mean stealing the shape of an earlier car. It means reclaiming the motifs that belong to Alfa Romeo by traditional right and reinterpreting them in the light of opportunities offered by present-day technology and contemporary customer taste. - Inauguration of the 50th Anniversary of the Giulietta. - parade and public presentation of the cars during the afternoon. - In Milan, opening of the exhibition 'Giulietta ed il suo tempo' at the Palazzo della Ragione. The finest examples of the Giulietta and the items and documents that made history and decreed its success can be admired until 20 June 2004 (entrance free). - In Milan the fashionable central streets are decked out in festival mode for the Giulietta with a display of Alfa Romeo vehicles, classic and present day cars to be discovered in the finest corners of the city. - Open day at Alfa Romeo Dealerships throughout Italy. - In Milan, at 9am the classic cars leave piazza Duomo, and proceed through the streets of the city centre to the Balocco track, another place that symbolises Alfa Romeo's sporting tradition (this event is reserved for drivers entered in the Gathering). - In Monza, 2004 Intereuropean Cup at the race track. Two days of great international spectacle with races between the finest classic cars, the Giulietta Trophy and a car memorabilia market. - Final day of festivities in Milan. - In the afternoon, international gathering of classic Alfa Romeo cars (1910-1970) with a display in Piazza Duomo. - At 5:30pm, again at piazza Duomo, concert by the Teatro alla Scala Chamber Orchestra. - Gathering on the Balocco test track with regularity races (event reserved for drivers entered in the Gathering).